The call for nominations for the BioSB Young Investigator Award 2017 is open! This is the 8th time that the award will be given to a young researcher in the bioinformatics or systems biology field. The award ceremony is planned during the BioSB 2017 confererence on April 4 in the afternoon. 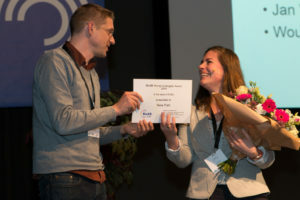 The winner is awarded a prize of 500 Euro which is sponsored by the BioSB research school. Additionally the winner gets the opportunity to present an honorary lecture during the plenary programme of the conference. The candidate must have conducted his/her bioinformatics or systems biology research primarily in a Dutch institute. The primary result on which the award will be based is the PhD thesis written by the candidate (submitted to PhD committee at university on March 1, 2017 at the latest). 2017 February 01 in BioSB 2017. Call for abstracts BioSB 2017 conference is open! ← Call for abstracts BioSB 2017 conference is open!